The next selections are feature vocals that are almost too sentimental, but the singers are all top-notch, and with performances this magnificent it’s easy to forgive a little maudlin. The instrumentation is all understated, placing Waller’s honeyed vocals squarely at the center of the listener’s attention. Waller’s voice is much less animated than in most of his recordings, as he prefers to let the simple, sweet melody and lyrics speak for themselves. In addition to Waller’s effortless piano, Rudy Powell’s clarinet wistfully responds to each line as it is sung, and Herman Autry has a subdued trumpet solo during the break. Fred Astaire was not the strongest singer of his day, but he used what he had marvelously. 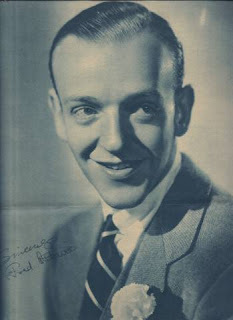 “Cheek to Cheek” is a great example: the fragile delicateness of Astaire’s voice in the higher notes actually adds to the tenderness of his delivery and strengthens the sentiment. This is a lovely song, well arranged and beautifully performed. Just listen to the subtle but exciting way the violins answer Astaire as he sings, “Heaven, I’m in heaven.” Heavenly! “Pennies from Heaven” shows why Crosby was the top crooner of his generation. His full, baritone voice is in top form as he slowly unfolds the sentiment in every word, stretching each note to its dramatic limit. The highlight of the record may be the introduction. It has a looser, more playful feel and Crosby magnificently fills the space with a reassuring warmth, setting the stage for the more familiar refrain that dominates the rest of the song.